Trout fishing in Michigan is some of the best fly fishing between the Rockies and the Catskills, especially in the north. When we are trout fishing in Michigan we employ all of the fly fishing tactics. Everybody’s favorite, dry fly fishing, streamer fishing, nymphing, and swinging soft hackles all produce at times and on certain waters. We have abundant hatches starting with Little Stoneflies in April to the BWO and Ephron hatches of late summer and early fall. Trout fishing with dry flies in Michigan is prime in May and June. Dry Fly fishing really kicks off with the start of Hendricksons around Opening Day, the last Saturday in April. They are followed by Black Caddis, Sulphurs, Mahoganies, Brown and Grey Drakes, fantastic Isonychias and the mighty Hex . All of these hatches attract trout to the surface making them vulnerable to fly fishing anglers. The Boardman, Manistee, AuSable and Pere Marquette are all high quality mayfly habitats and provide quality hatches at times. When the hatches diminish the terrestrials kick in. Big trout smashing hoppers, or beautiful brook trout sipping ants is what keeps our summer fly fishing fun. Shorts, sunblock and lots of action, great way to spend a summer day fly fishing. Most of our waters, but not all, are less than 150 feet wide making them ideal for fly fishing. Trout fishing in Michigan is more about presentation then distance. Accurate casts with good presentations are the key to catching rising fish. Accuracy is important but so is the drift. Most of our water is smooth currents, gin clear and not very deep. Dead drifts are mandatory so the Reach Cast is the preferred presentation. Get command of a quality and accurate Reach Cast and you will catch more Michigan Trout. Rods for Michigan Trout Fishing should be 5 to 7 weight, 8 1/2 to 10 feet long and whatever your favorite action is. I like a 9 foot fast action 5 weight for dry flies and a fast 7 weight to deliver my 250 grain sink tip for streamers. Lines are self explanatory, a floater and a 250 grain sink tip. Leaders are pretty simple. I like a 7 1/2 foot tapered monofilament for dry flies, nymphs and soft hackles. I carry them 2-4X, that handles all the different sizes of flies that I use in a season. For streamers I carry 6, 8, 10, and 12 pound fluorocarbon. I put 3 feet of one size on the end of the sink tip and tie a fly on. If I’m using a specialized fly that I really want to move when stripped I might use a longer length of fluorocarbon. Northern Michigan, deservedly so, has a long tradition of streamer fly fishing. We have some very big resident trout (up to 30 inches) in our waters. Many of those really big trout are taken on streamers. A 7-weight rod loaded with a sink tip can be deadly at times. We do a lot of it. Two of our guides, Russ Maddin and Chuck Hawkins both have many of their streamer fly patterns available from Orvis and others. Patterns that include Mad Pup, Nutcracker, the Closer and Triple Double. If you haven’t fly cast a sink tip for trout don’t let it intimidate you, we can teach you in no time. Watching large fish track down a stripped fly will get anyone’s heart pumping. 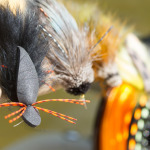 Another method that we employ in trout fly fishing in Michigan is nighttime mousing. This is throwing fur balls, waking them through the water to entice hungry foraging brown trout. If you don’t mind fly fishing in the dark, this is wild. You never know how big a fish is going to cream your fly! Another way to increase your success when Michigan Fly Fishing is to perfect your setting technique. We see many common hook setting mistakes. First, let the fish actually eat the fly before you set. Jet setting terrestrials usually results in missed fish. When streamer fishing, wait util they eat it then strip strike, don’t lift the rod. That way the fly is still in the fish’s view if they missed or just punched it to stun it before eating it. 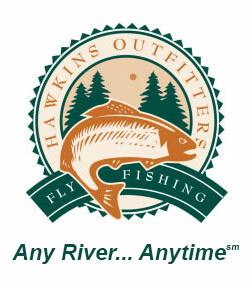 Hawkins Outfitters is fully permitted by the State and Federal governments to fly fish all of the best trout water in Northern Michigan. From the cold fast Pine River to the slow insect rich Upper Manistee, we fish them all. 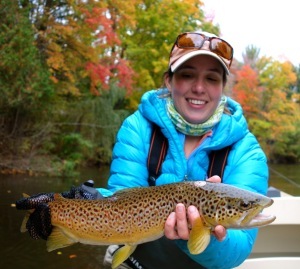 Trout fly fishing in Michigan is a year round possibility. Dries, streamers, soft hackles and nymphs all have their times and places. Join us on Any River…Anytime!